These are my thoughts on Sayu's Graduation Announcement, what Sayu means to me as a fan and also what I personally think she has done for the group. You do not have to agree with everything in here, just so you know; what I say is not valid for everyone. This is all purely based on the opinions I have, it is not solid fact. We can all agree to disagree. This has been my desktop for a while now, and it will stay that way for a while!!! This post is a little late due to the fact that this whole day I have been distracted with other stuff such as video editing and entertaining my baby niece, who has a tendency to come into my room and want to play on the computer or have me put make-up on her, so my sincerest apologies. Of course, as everyone and their mother knows by now, Michishige Sayumi has announced her graduation from Morning Musume ('14) and Hello! Project, and is set to leave the group at the end of their Autumn concert. Her message, as well as the message from Tsunku and the official statement for the Hello! Project website, have all been translated thanks to Takamruyo, so be sure to read them all. I, Michishige Sayumi, will be graduating from Morning Musume on the final day of Morning Musume ’14′s 2014 Autumn concert tour. I have said roughly two years ago when I was appointed leader that I would “pay my debt of gratitude to Morning Musume”. During it all, it has not been by my efforts alone that we were able to achieve 5 consecutive Number 1s, but through all our various activities, little by little, I feel that perhaps I was able to pay off the favor. Therefore, after consulting with Tsunku-san and the company, it was decided the graduation will take place in this year’s concert tour. Nevertheless, there is still time left, I still have things I want to teach and to show my juniors. I would still like to create precious memories with all the fans as well. And now, from here on is when I truly pay back the favor. I would like to graduate from Morning Musume in its best form, as I pass the baton over to the next generation. My reaction to this news was exactly this; "....................................................... What?" and then a few tears pricking the eyes and a need to process it all. It was a bit of a shock to the system for me, if you will. Still, this was to be expected. I mean, she's been around for 11 years now and the Morning Musume she came into and knew has gone, and she's succeeded in a way most of the leaders before her haven't succeeded before - it's her time to go, though I will admit that I didn't expect this announcement now. More like Autumn time this year, which ironically is the time she's actually leaving, but there we go; she's going, and one of my damn predictions has come true, albeit it being one of the few predictions I didn't want to come true this year. At all. But as I said, and as many people will say; It is time for Sayu to leave, and now is as good a time as any. 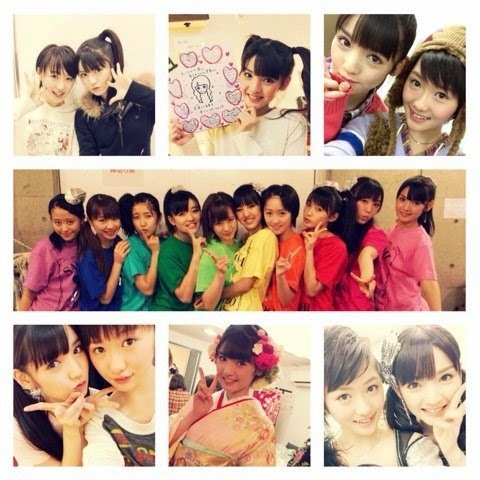 Sayumi has been around to see many sides of Morning Musume, if you think about. She has seen them in the dire state that was the Platinum era à la Takahashi Ai, she has seen them in the middle of rising back to the spotlight, and then she has seen them back in the spotlight thanks to her leadership; she's basically been through a cycle that is similar to life, death and then rebirth, with her as the creator essentially. From the ashes, she brought Morning Musume back to the flame and from there, they were reborn. From a fans point of view, we have seen Sayu work hard with the group that she loves so much, both defending and fighting for it from many sides, and grow up as a result too. Ever since becoming a leader she has truly blossomed and proven that she is different from the other leaders who headed the group, continuously showing that her efforts were to not be in vain and allowing us to see how much she truly loved this group, a group she was finally leading; she had the drive and determination for the group that other leaders had lacked since the Golden years, and thanks to everything she put into not only promoting the group but the other members, putting her own TV image on the back-burner in order to do so, she has watched Morning Musume grow from a group of awkward, mismatched members who felt more like a cluster of toddlers into something more, something more refined. As a Leader Sayumi is powerful, admirable and, above all, amazing. She is someone who I, as well as many others, respect. Even though her graduation announcement has garnered a lot of attention and tears, I am honestly glad to see her leaving on a high note; Morning Musume have reached a record of 5 consecutive #1 singles on the Oricon chart, with their previous record only being 4, and I feel like Sayumi was waiting for something like this to happen before she went - it just means that when she goes, she will leave knowing that Morning Musume are in a better form than the one she experienced when she was simply a member and not the leader. She's leaving with a peace of mind, I suppose, and I don't blame her; why go when the group you love so much has once again fallen back into a cycle of bad promotion, zero recognition and/or an endless cycle of only one member being known by the public of Japan? It would kill anyone I believe, so I really don't blame Sayu for leaving now, when Morning Musume is recognised and liked by the public again. It was the Morning Musume she grew up knowing after all, and the Morning Musume she hopes to see even after she's gone I believe. All she ever wanted was to see Morning Musume be successful again, and she has achieved that completely. Sure, I have my fears of what might be after she's gone; don't we all? I mean, she's the best leader the group has had in a long time. She has cherished and nurtured Morning Musume, caring for all of the members who have come in during her time and truly bringing the group together. She has made this group feel whole in my eyes, creating a balanced and level playing field. It once felt like it was just these older girls and some kids, with Riho as a front-runner and the rest playing backing dancers, but now it really feels fuller and a lot more friendly. She made Morning Musume feel like 'Morning Musume' again. I'm really going to miss Sayumi when she goes, because she has always been a member that always seemed to be 'there', someone I could rely on to never go away. From the year of 2009, when I started watching Morning Musume, she was a member who I thought was cute and fun to watch, and now she has become a member who is so beautiful and who has truly matured in many ways. She is no longer that cute, sugary-sweet girl with a tongue like acid, but instead a young woman who has developed fully as a leader and proven just how passionate she is about the group she has lead up until this point. We don't have long now, but the time we do have with Michishige Sayumi of Morning Musume ('14) will be cherished by the fans. From now until that point, I look forward to what Sayu will bring us during her last months with the group she has raised so well. Lovely, lovely post. She is truly the perfect idol & leader and she'll be missed. Thank you for saying what i think. She had shown that weakness could be use to rise. She should be an example for many people. Idols and Fans. I will miss her, but im sure, she had done the right thing. I feel the opposite. I'm glad because she's played her part and now she's moving on. I understand a lot of people are upset as well because she was the last member of Platinum Era and even during Shabondama era but I'm still happy she's leaving.